So I used to have this mole under my right eye. I say used to because when I was 20, my mom took me to have it lasered off. She's fairly superstitious and said that the position of that mole was like a tear on my face and would thus bring me sadness. She was rather insistent so just went with it. The procedure was quick and burning hot but it banished the mole for good. I've been lucky to not to have to really deal with any other moles on my face but I am vexed by dark spots and freckles which are the result of being less vigilant about sun protection when I was younger. It's a constant battle and if laser treatments weren't so pricey, I'd probably just have went that route. Enter Dr. Fredric Brandt's new line of serums created to mimic the effects of in-office dermatological laser treatments. I learned about these skin fixers at an event hosted by Birchbox Soho last month. Dr. Brandt, a noted celebrity dermatologist and anti-aging authority was on hand to personally introduce his Laser Fx line and explain how they work. These treatments feature a breakthrough smart dual encapsulation system to deliver precise skin targeting, penetration and higher efficacy. There are three products in this series and each is specifically formulated to provide focused results in addressing particular skin concerns. Laser Fx Perfect Serum: Targets fine lines and wrinkles. Wrinkle smoothing in a serum infused with Gotu Kola, Bioemetric Tri-Peptide and Heptapeptide encapsulated actives. Instantly skin looks smooth and soft. After one week, skin looks plumper. In two weeks, fine lines and wrinkles diminish. Three weeks later, skin texture improves dramatically. By week four week, skin is transformed. Laser Fx Lift Serum: Targets sagging skin. Tightens, firms and redefines the face contour with a customized blend of amino acids and Sweet Pea and Acmella Oleacera Extract and Hexapeptides. This potent serum creates instant firming and tightening. In just one week, skin texture is improved. After two weeks, skin looks lifted. By the third week of use, elasticity and suppleness are restored. After one month, the face contour is more visibly defined. 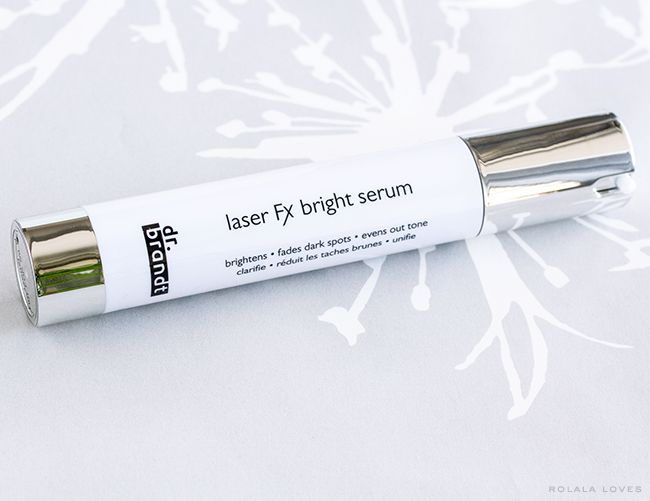 Laser Fx Bright Serum: Targets dark spots and dullness. Brightens skin while fading dark spots and evening tone with Encapsulated Vitamin C, Epidermosil and Knotgrass Extract - a proven infrared and thermal aging fighter. With just one application skin look instantly more luminous, In one week, skin looks brighter and after the second week, imperfections look diffused. Three weeks in, dark spots and discoloration fade. After four weeks of use, skin is visibly more even and radiant. After a brief consultation, the Laser Fx Bright Serum was recommended for me and I received a bottle along with some other Dr. Brandt goodies to take home to try. I wanted to wait until I'd been using it for awhile so I could offer a fair assessment of the product as I was told by one of Dr. Brandt's nurses that it could take up to a month to truly see results. After finishing up my Vitamin C serum, I started using this serum every morning and evening after we returned from our vacation so it's been almost 4 weeks now. I was able to seamlessly integrate the serum into my skincare regimen following my toner and before applying my essence without any irritation or issues. The product has a barely discernible scent and light consistency that applies smoothly. I was taught to gently rub it into my skin in order to activate the ingredients. I can say that results I experienced seem to be more gradual than the product claims but there has been a visible improvement in the overall radiance of my complexion. My freckles and spots do appear lighter and an acne scar on my chin has pretty much faded. I'm impressed and hope to see continued results. The Laser Fx serum series is formulated without parabens, sulfates and phthalates and each one retails for $78. Yes it's a little pricey but that's still a fraction of the cost of a Fraxel laser treatment and it's painfree. They are available through Sephora, Birchbox, Skinstore as well as Dr. Brandt's website. Are serums part of your skincare routine? Have you tried any Dr. Brandt products? I heard about this brand so many positive things I need to try it out great post. 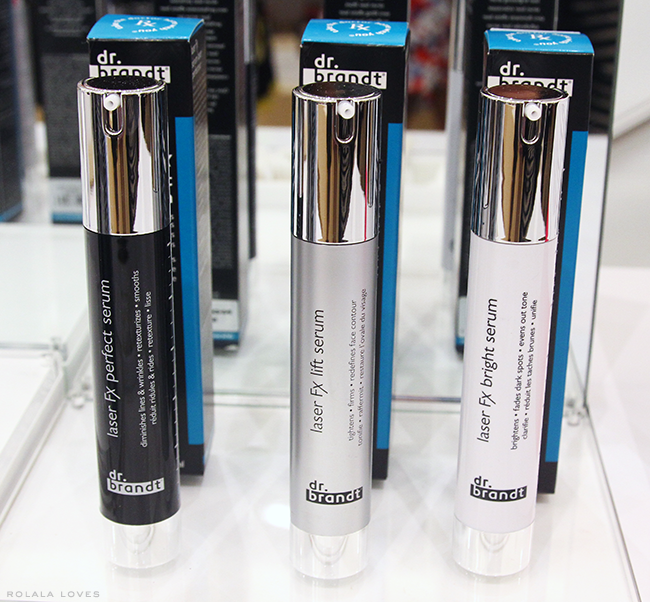 I've been dying to try Dr.Brandt products but they are pricey! Sigh....all these serums sound fantastic too. PS We have the same superstition about moles in that area! love just about anything dr brandt!! A fascinating product and helpful review. The mole under your eye removal story is so interesting! I took my husband to a facial reader and she told him that the mole on his cheek (under his eye) was a symbol of his compassion and empathy for others. It is like a symbolic tear. WOW. Love that stuff. I've been playing with serums lately - this is a tad expensive, I've never heard of the brand before though. I have read many great things about Dr. Brandt products but oh my goodness, are they pricey! I do love serums, am mad about them so I might sac up and give this range a go. Serums are not part of my daily skincare routine and to be honest, they are not very familiar to me. But I have acne scar and I hate it! So I guess I have to think about something like that. Maybe the Laser Fx Bright Serum will work great on my skin. Thanks for sharing the review. Yes, products are a little bit pricey, but when it comes to my skin, I don't really care. I have always wanted to try out some products from Dr. Brandt. I love trying out serums hoping to find "the one" one day. I would like to try these serums!!!! I've heard of Dr Brandt but have never tried it. That serum sounds promising! I would love to try the brightening product. I have difficulties finding the perfect foundation to cover my freckles, so this one sounds like a potential solution. Thanks for sharing this info! I think I could use the Vitamin serum too as I have some pigmentation on my face since falling pregnant! Oh these look great, I am so in the market for some serums. I will have to keep these in mind! And thanks for the heads up, they were dressed so similar in fact I just saw a picture of Jenna at the same event and she had her hair in ponytail and I thought hmm...when did have time to change her hair..hahaha..
Hi Rowena, I have heard of the brand before but I haven't tried anything yet. I use a serum from time to time. All three serums sound great. I would have chosen the bright one too. Sadly it's a bit pricey but it it works who cares. Have a happy Tuesday!! I can definitely relate as I've had moles on my face removed and it can definitely leave scars. I have used Dr. Brandt's and they have such great quality products and I've never heard of this serum. Thanks so much for sharing!! This sounds very interesting. I've not tried anything like this particularly, but yes, I do use serums and oils as I mentioned before. Thanks telling us about this product. love the packaging! Thanks for sharing..
very very impressive! i am cursed with adult acne and have acne scars on my face now. grr! It sounds like good gradual results! Glad you got to try them. I was wondering about this brand. haven't tried dr.brant before but i probably will in the future..
i have been wanting to add an antioxidant serum to my routine. thanks for your review of these. I've never tried Dr Brant. Thank you for the review - I think a serum is really beneficial for the skin. I love your dolls, by the way. They are so, so cute. This is interesting. I may need to try something at some point...my skin is not getting any younger, and could probably use a little help like this! Thanks for nice blog. We help you to make the most of your money by providing a free, easy to use online service so you can compare a wide range of trading product options in one place and find the company that most suits your needs.